During my Disney travels over the past twelve years, there was always an extra member of our traveling party... the stroller. Looking back I can honestly say I've done it all when it comes to theme park hopping with strollers. We have used our own, rented singles and rented the double. We once tried to go without a stroller when our youngest was 5 years old. Let's just say that lasted an hour, and we were in the rental line again. Whether to rent or bring is a personal preference issue. My rule of thumb was always bring your own stroller for infants. For toddlers, and older kids who cannot walk tremendous distances, go ahead and rent. And those of us who have stroller rental experience are happy to share the good, and the not-so-good aspects of the process. I like that I don't have to pack the stroller, clean the stroller and keep the stroller in my hotel room, where space is precious. 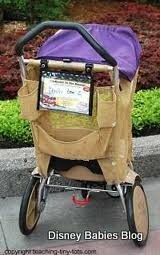 The rental strollers are sturdy, maneuver easily and are pretty easy to push through the parks. A rental option which allows a family to rent a stroller at their on-site resort. This would allow for usage outside of the parks. The grounds at some resorts, like the Port Orleans Riverside, can be quite expansive. Strollers need a place for a real diaper bag. Those small, mesh hanging bags are just too small. Strollers need to recline. Period. Enough said. Canopies on strollers should retract. I hated that I could never see the expressions on my kids' faces because they were hidden under a stroller canopy that did not open and close. Nope, I don't recline, and my mesh bag is tiny! Please, rent strollers in multiple colors! 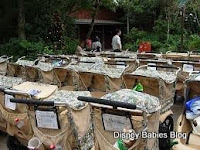 There is nothing more frustrating than happily leaving an attraction, only to return to the stroller bay unable to locate which one is yours. Not only does it look exactly like all the others (even though you tied your bright red bandana to the handle), but the ever-villigent stroller attendant has likely moved it from its original parking place. Multiple colors would at least help parent locate their stroller more quickly, and likely save well-intended, stroller-hustling Cast Members from enduring nasty looks from frazzled moms. Try and find yours, I dare you! Overall, I am one happy stroller-renter. Or I was... my next trip will be completely stroller-free for the first time. Time sure does fly. Enjoy these times, they are gone in a flash! See you next week! You can catch me on Monday, Wednesday & Friday over at The Disney Lifestyle Blog. Happy Strolling. Since I am an Orlando local, we always take an el cheapo umbrella stroller to the parks with us. I was really upset at Animal Kingdom that a cast member hung 3 identical el cheapo strollers side by side at the stroller return (shame on all of us, they were not marked with our names...although mine had string on it from my son's previous balloon which I used as a marker). I asked to take mine with me since it was so compact, but Disney refused (rules are rules). Anyway, when we got off the Safari ride...someone had taken our practically new el cheapo stroller and left us with their ice cream covered mess! I was NOT happy at all. But on the bright side, at least this happened to our el cheaper stroller and not our expensive Bugaboo (I refuse to take it to the parks for that very reason). 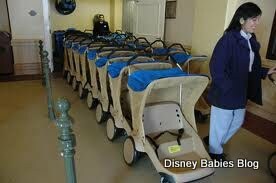 LOVE the idea about stroller rentals from the resorts, you may want to give that feedback to Disney. Interesting look at the Strollers, and I completely agree that there needs to be a variety! I don't know if it is Disney or someone else, but there has been new Stroller Kiosks popping up all over the place to rent strollers. They're definitely aren’t the most comfortable or convenient strollers. They are made of hard plastic and don’t recline. You can't take them out of the park. Plus, they are are little expensive for many budget-minded travelers. I recommend renting strollers outside Disney. They are way cheaper and offer a variety of strollers that will suit your taste.